Twins born in different countries! Did you try my 'brick wall' challenge? Will your newsletters stop arriving? Is there such a thing as a free will? The LostCousins newsletter is usually published fortnightly. To access the previous newsletter (dated 29 June 2012) please click here; for an index to articles from 2009-10 click here. Whenever possible links are included to the websites or articles mentioned in the newsletter (they are highlighted in blue or purple and underlined, so you can't miss them).For you convenience, when you click on a link a new browser window or tab will open (so that you don’t lose your place in the newsletter) - if nothing seems to happen then you need to enable pop-ups in your browser. Findmypast have just released images of the Kent parish registers held in the Canterbury Cathedral Archives, which have been closed to visitors for several months. For the very first time I've been able to see the signatures of my great-great-great-great grandparents Thomas Smith and Mary Ratlief, who married at Swalecliffe in 1784 - which has enabled me to confirm the very unusual spelling of her surname, and also spot the marriage a year earlier of William Ratlief, who was a witness at my ancestor's wedding and so was probably her brother. Currently the registers are available only as browsable images, but findmypast are currently transcribing all the registers in the collection so that later this year it will be possible to search them by name, in the same way as the other parish records on their site (in the meantime it's also worth trying the new FamilySearch site - see the article below). Click here to find out which parishes are included in the Canterbury Collection. Earlier this week Ancestry.co.uk updated the JewishGen Online Worldwide Burial Registry, which now includes nearly 1.2 million records. Click here to search the registry. It's rumoured that Ancestry will be launching a collection of Lancashire parish registers later this month. Click here to see a list of the datasets that have been most recently added or updated (the Lancashire information will be at the top of the list the moment it becomes available). Although in an ideal world the 'old' FamilySearch site would have been left online indefinitely, there is so much more data at the new site that it should prove to be a big step forward - once we've unlearned some of the techniques that worked so well for us at the old site, and discovered how to get the best out of the new one. There are numerous video tutorials on the new site, but I haven't - so far - found it necessary to look at them, because the site is really simple to use once you get the hang of it. Regular readers of this newsletter will know how frequently I bang on about the importance of entering as little information as possible on the Search form, whichever site you're using. FamilySearch have made that rule easier to follow by presenting a very basic search form with just two boxes, 'first names' and 'last names' (to enter any more information you have to take the positive step of clicking on one of the blue links). If the record you're looking for isn't on the first page of search results you can filter the results, rather than simply ploughing through page after page. If you haven't used filtering before it will seem a little strange at first, but it's worth persevering - think of it as a search within a search. Note: although you can search the IGI at the new site, the entries submitted by individuals currently aren't included. However, since well over 90% of individual entries were either duplications or complete tosh, that's probably not a bad thing! As I was finalising this newsletter I noticed that the database most recently added to findmypast was a small, but very interesting one. Between 1917 and 1925 over 11,000 operations were carried out on soldiers who had been injured during the war by Dr Harold Gillies, who developed the first skin-grafting and plastic surgery techniques. Click here for more details. People's Collection Wales is a government-sponsored website which has thousands of photographs from museums, archives, or uploaded by individual users. If you have Welsh ancestry it's worth taking a look - and I'd encourage you to contribute photos from your own collection that might be of interest to others. There are now over 700 Post Office directories online at the National Library of Scotland's website. The earliest dates from 1773, the most recent from 1911, and you can search each directory by name. Back in 2010 when there were only 280 directories online the target was "over 600" directories, so it's good to see that this target has been beaten. Northern Ireland BMD registers to go online? According to Claire Santry's blog, Irish Genealogy News, the General Register Office for Northern Ireland (GRONI) is going to be putting its registers of births, marriages, and deaths online. If all goes according to plan then at some point during 2013 it will be possible to access births from 1864-1913, marriages from 1845-1938, and deaths from 1864-1963 - all from the comfort on your own home. As the equivalent registers for Scotland are already online this will leave England & Wales as the only countries in the UK not to offer online access. The 2011/12 accounts for the Identity & Passport Service, which includes the General Register Office, reveal that the income from certificates sales fell from £15.89m to £15.34m, a drop of between 3% and 4%. However they also indicate that because of reduced costs there was an Operating Surplus of £606,000 - which compares favourably with the deficit of £510,000 recorded in the previous year. 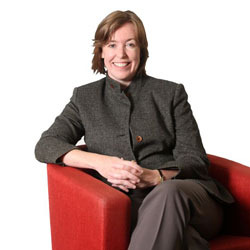 The accounts also reveal that Sarah Rapson, the Chief Executive and Registrar General, who receives a basic salary of between £110,000 and £114,999 per annum, waived the bonus of £7,000 to which she was entitled for the 2011/12 financial year. Unfortunately, even if the whole of Ms Rapson's bonus was used to subsidise the cost of certificates, the price reduction would be less than 1p. Why don't you keep your bonus, Sarah, and instead give us the online access we've been requesting for years? You've just reminded us that it's 175 years since the GRO was founded - so isn't it about time the GRO was dragged kicking and screaming into the 21st century? The Daily Mail this week reported the story of a mother who gave birth to twins, one of whom was born in England, the other in Scotland - that will certainly confuse the family historians of the future! You can read all about it here. The Daily Mail also had a feature last weekend on the German system for unwanted babies, which I mentioned last month in my article about foundlings. I'm delighted to say that I've once again persuaded findmypast to create an exclusive discount code for LostCousins members. From Saturday 14th July until 11.59pm (London time) on Monday 30th July you can save 10% on any new subscription to findmypast.co.uk (other findmypast sites around the world are not taking part in this offer). Follow the instructions below carefully, because when you save 10% on a findmypast subscription using the exclusive offer code, you can save 100% on a LostCousins subscription. That's right - you can get a free LostCousins subscription that runs for the same period as your new findmypast subscription, so the total saving could be as much as £23.50! Please note that the offers don't apply to renewals (which already benefit from findmypast's generous Loyalty Discount - see here for full details), nor can you combine them with any other offers. But it needn't be the very first time that you've ever had a findmypast subscription - if you are rejoining findmypast after a break you'll still qualify (and you could well be amazed at how much more you get for your money - there have been so many new datasets added over the past couple of years). During the offer period EVERY findmypast.co.uk subscription, even the most expensive, costs less than £99. For around 27p a day you can have unlimited access to ALL of findmypast's UK databases with a 12 month Full subscription - and personally I wouldn't settle for anything less than a Full subscription..
(1) Click here to go the findmypast.co.uk website (it will open in a new tab or new browser window), then click Subscribe and either register or log-in (if you have registered previously). Don't use a bookmark or type the website address because then you won't qualify for a free LostCousins subscription. Depending on the exact sequence of events you may see a different screen - but the information will be the same. 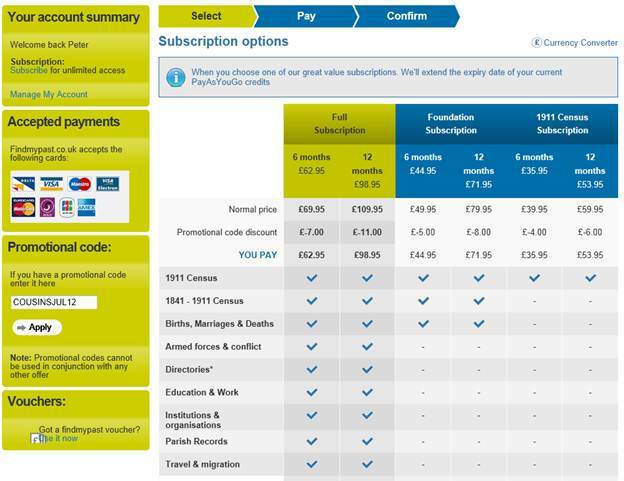 Just make sure that the discounted prices are shown before you select your subscription. (3) Choose the subscription you prefer, bearing in mind that the 12 month subscriptions offer by far the best value (the second six months is virtually half price!). I also recommend the Full subscription unless you're an absolute beginner since the numerous additional datasets are well worth the small additional cost. (4) If during the process you are logged out for any reason, or if your credit card isn't accepted, start again at step (1) to ensure that you qualify for your free LostCousins subscription. (5) A few minutes after purchasing your subscription you will receive an email receipt from findmypast - please forward a copy to me so that I can verify your entitlement to a LostCousins subscription and implement it (it is not an automatic process). Your free LostCousins subscription can include your spouse or partner as well - just make sure that the two accounts are linked together before you write to me (the Subscribe page at the LostCousins site explains how to do this). You must claim your LostCousins subscription before the end of July - late claims involve me in a lot of extra work and cannot be accepted in future. Tip: if you want to share this offer with other researchers, don't simply pass on the code. Instead, please send them a link to this newsletter - because that way they might be inspired to link up with their own 'lost cousins'. There was a fantastic response to the challenge I set in the newsletter before last, with around 100 members sending in entries. Most entrants correctly identified the correct GRO birth entry - but by no means all of them. Because there were so many excellent entries it was very difficult to pick only one winner, but after much consideration (and several cups of coffee) it was decided that Karen had submitted the best entry. I was impressed by the straightforward way she got to the right answer, and she was also one of the few entrants to identify a possible sibling who died as an infant - and so wasn't recorded in any of the censuses. Karen will shortly be receiving a totally unique LostCousins T-shirt printed with the surnames of some of her ancestors - just the thing to wear at a family history event! Note: whilst it wasn't a factor in the decision, you might be interested to know that Karen compiled her entry using only free searches, because she doesn't have any current subscriptions. I've decided not to publish the solution in the newsletter, since this will prevent the same 'brick wall' being used as an exercise for other researchers who are seeking to hone their skills. After all, whilst there may have been 100 people who sent in entries, and perhaps 200 or more who tried and failed to find a solution, that still leaves 60,000 readers of this newsletter who haven't yet had a go (if you’re one of them, click here for the original article). A month ago I offered a few general tips on knocking down 'brick walls' and illustrated it with some examples from my own tree (click here to read the article again). This time I'm going to offer some specific techniques that you'll find useful in your own research. When you're up against a 'brick wall' there are two key problems - one is that some of the information you already have is likely to be wrong, the other is that it won't always be obvious which clues are the ones that are going to lead you to the solution. Something that appears insignificant (the name of a marriage witness, for example) might be a vital clue, whereas something apparently vital (the name of the bride's father, perhaps) might be a complete fabrication. For example, when I posed the challenge last month I presented it exactly as Marilyn had given it to me when she asked for my help. Some of the information turned out to be irrelevant, and some of it was downright misleading - but I deliberately left it all in because that's what it's like in the real world! In this case I'd already solved the 'brick wall' before presenting it in my newsletter - it wouldn't have been fair to set you a challenge without knowing that it could be solved, and how it could be solved - but remember that I didn't have anyone to tell me how to do it, or which bits of the jigsaw puzzle had ended up in the wrong box, and nor will you when you're tackling your own tree. This means that all the information you start with has to be regarded as questionable. I'm not just talking about the stories that were handed down within the family - we all know that they're likely to be wrong - but also about the apparently reliable evidence - the BMD certificates, the military records, the census entries. You also have to be careful not to make unwarranted assumptions. It's not only the 'red herrings' in the evidence that we have to watch out for, but also the traps we walk into of our own accord - often because we assume that what works 95% of the time will work 100% of the time. For example, when we search for a marriage we tend to assume that the wife was using her maiden name - and yet she could have been a widow at the time of the marriage (in which case she'd almost certainly have been using her late husband's surname). Another example: when we see people on the census described as sons and daughters we tend to assume that they're the children of the head of household and his or her spouse - yet that won't always be the case. Sometimes the order in which they appear offers a clue, but that won't always be the case. One of the most difficult traps to avoid is created when a widowed husband marries a woman who bears the same first name as his late wife. Usually there will be a difference in the age or birthplace shown on the census that provides a clue - but unless we're alert to the possibility we may not put two and two together. A common mistake is to assume that everything has to be solved in chronological sequence. You might think, for example, that you have to find out who your ancestor's parents were before you can find out who her grandparents were - but that isn't always the case. Another time when lateral thinking comes in handy is when you can find the answer - or part of the answer - by asking a different question. For example, you might not be able to find your direct ancestor's birth certificate - but maybe you can find her brother's birth certificate instead. And following on from that last tip, what if you can't find either certificate - doesn't that suggest there's something strange going on? When something like that happens your next step should be to run through all the possible scenarios - no matter how unlikely - that might result in this lack of evidence. Breaking down 'brick walls' requires not only determination, but experience. Almost all of the people who tackled the challenge I set last month learned something new that they could apply in their own research, and that's why I'd urge anyone reading this who hasn't already had a go to try it. After all, unless you can solve Marilyn's problem (which you can do without any subscriptions, any credits, or any visits to records offices), what chance will you have of solving your own 'brick walls', which may well require you to spend hours hunched over a microfilm reader? You might think that solving your own 'brick walls' is easier, because you have more knowledge of the circumstances and may even have met some of the people in your youth - but it's hard to be objective when you are personally involved, so it's actually far more difficult. At the end of Karen's winning entry she wrote "It would be a great idea to have a regular brickwall feature". I can't promise regular challenges, but I do have a second challenge - and whether or not you were attempted the challenge I set a month ago, I hope you'll have a go at this new one. On 13th May 1880, at All Saints Church in the parish of St Mary, Haggerston, Gifford Few - a builder aged 24 - married Emily Taylor aged 23. The groom's father was shown as William Few, gentleman, the bride's as George Taylor, a builder. Your challenge is to find the happy couple on the 1881 Census, which was taken less than a year later, and convince me that you've found the right census entry. The 1881 England & Wales Census is available free at several sites - including findmypast, Ancestry, and FamilySearch - so once again you don't need a subscription to solve this problem. Whilst there's no closing date for this challenge, I will be picking the prize winner from the correct entries received by Thursday 26th July - and in choosing the winner I'll be looking for the most concise yet convincing solution. Once again the prize is a unique LostCousins T-shirt bearing the surnames of up to 8 of your ancestors - just the thing to wear at a family history event (no matter how old you are). Over the past year or so I've had numerous emails from worried members concerned about my welfare - and in each case it was because the emails that announce a new edition of my newsletter had stopped arriving. In the past 4 weeks alone I have removed 38 members from my mailing list because their email accounts had been hacked. How did I know this? Because I had received spam from their email addresses! When they update their My Details page with their new email address they'll automatically go back on the mailing list. But there are also hundreds, perhaps thousands, of member who are still on my mailing list but don't receive my emails because they have a Freeserve, Orange, or Wanadoo addresses. For over a year those email providers have been discarding most of the emails I send to members - and they don't even have the decency to return them to me, or tell the recipients what they are doing. Finally, every month I lose contact with between 200 and 300 members simply because they didn't update their My Details page when their email address changed - and that's why, even though new members are joining every day, the number on the mailing list for this newsletter is stubbornly stuck at just over 60,000. In most cases I can track them down should one of their cousins want to get in touch using either the secondary email address they have provided or their postal address - which is why your chances of hearing back from the cousins you find is so much greater at LostCousins than at any other site. But it would be so much easier for all concerned if the information was updated in the first place! Tip: if you're still using the temporary password you were issued with when you joined, why not change it to one that you'll easily remember? That way you'll be able to access your account even if your email address has changed. BBC Radio Scotland is seeking stories for the next series of Digging Up Your Roots, which will be going out in January and February of next year. If you have a family mystery you want solved or have a burning question about the life of an ancestor then maybe their team of genealogists can help? Write to diggingupyourroots@bbc.co.uk if you would like to contribute (and if you're chosen to be featured on the programme, do please let me know!). A LostCousins member (who I won't name) recently visited the Probate Office in High Holborn. It wasn't her first visit, but when she'd been previously the Probate Office was on the ground floor, with a separate entrance - now it was on the 7th floor, and getting to it involved going through exactly the same security checks as those who were attending the matrimonial courts. As it happened she was in London on her way back from a family visit, and like most people who have been away had a bag of personal belongings with her - which included both a nail file and a penknife which was a family heirloom. Both of these were confiscated, and she was told that not only would be unable to collect them on her way out, she would have to wait at least 4 weeks before a court would decide whether she could have them back at all! It turned out that there was - if one knew to look for it - an online guide that warned about the restrictions. But who would expect to be treated like a criminal or a terrorist when innocently researching their family history? Ironically the government department responsible for this Kafkaesque approach is known as "Justice". It makes me wonder - are we in 2012 or 1984? A recent posting to the Society of Genealogists mailing list caught my eye, not least because it was posted by a LostCousins member who is a professional genealogist. Rosemary pointed out that the London Family History Centre in South Kensington (currently temporarily located at TNA in Kew) has microfilm copies of wills from 1858-1925 - and you can view them free (there may be a small charge if you want to take a copy home). What a great tip! Can you imagine what it must be like to be diagnosed with an incurable - and ultimately fatal disease? A few weeks ago I met an incredible woman who, despite suffering from two incurable lung diseases, has set herself a target that's as challenging as any of the Olympic sports we'll be watching in a fortnight's time. Her campaign, Save5, aims to recruit an extra 10,000 organ donors (so far 4,426 have signed up). On average 3 people in the UK die each day whilst waiting for an organ transplant - simply because most of us haven't bothered registering. There aren't many people who wouldn't accept an organ donation if it would save their life - I know I would - and yet only 29% of us have offered to help others if the roles were reversed. One reason is because people assume that they have to be young and fit to qualify as a donor - but that simply isn't true. There is no age limit, and the principal reason that organs can't be used has nothing to do with age - it's because very few people die in the precise circumstances which make organ donation feasible. Tip: although you may carry one of the old Donor Cards, that doesn't mean you're on the NHS database. You need to register under the new system to make sure that your wishes are adhered to. Until Tuesday 17th July you can get two photo books for the price of one when you follow this link and enter the discount code NB241PB1 at the online checkout. Yes, you could use photos of your last holiday, but it would be so much more creative to use photos of your ancestors! The interest rates on savings are so low that I've been looking at a website called Zopa which allows people to lend and borrow money without banks getting involved. If you have used Zopa or any similar site, either as a lender or a borrower I'd be interested to know how you got on. Ancestry's new Terms and Conditions have made it easier to get a refund when your subscription is unexpectedly renewed - you now have up to 7 days after the renewal date. However, the best way to avoid problems like this is to do what I do - I cancel my subscription on the day it starts, instead of waiting until the ends. True, I sometimes forget to renew - but, hey, when that happens I have more money in my bank account than expected, not less! Finally, an apology for any confusion I caused when I wrote last month about Ovo Energy. Prices vary across the country, so even though Ovo offer the best deal where I live, they won't necessarily offer the best deal where you are. That's why I suggested checking the Which? Switch website first. However, if after checking at Which? Switch you find that Ovo IS the cheapest supplier where you live, I recommend you get in touch with me before getting a quote from them - it could well be to your advantage! I hope you've enjoyed this newsletter as much as I've enjoyed writing it. I'm off now to make use of the refrigerator-full of fresh fruit that I picked up at the supermarket earlier this week at an amazing 85% discount. They slash the prices of food that's about to go beyond its sell-by date at 7.30pm most nights, and this was a night to remember! Blueberry Jam, Peaches preserved in Brandy, Roasted Nectarines with Ginger and Brown Sugar.... Mmmm! You may link to this newsletter, and I have included bookmarks so you can - if you wish - link to a specific article by copying the relevant entry in the list of contents at the beginning of the newsletter. However, please email me first if you would like to re-publish any part of the newsletter on your own website or in any other format.